The Skolkovo Foundation has teamed up with the multinational pharmaceutical and life sciences company Bayer to launch a competition to help biotech startups advance their projects and secure their intellectual property rights. The competition, titled Patents Power, was launched Wednesday by Skolkovo, Bayer and Skolkovo’s Intellectual Property Centre (IPC). Biotech startups working on treatments in the fields of cardiology, gynecology, oncology and ophthalmology have a month – until October 18 – to submit their applications, after which ten finalists will be selected by a jury of experts. The competition final and a seminar on protecting intellectual property rights will take place during the annual Patenting School held at Skolkovo and organised by the IPC, which will take place this year on November 1-2. 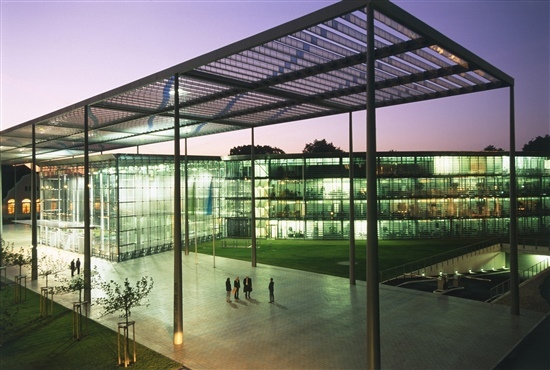 The multinational pharma company Bayer is headquartered in Leverkusen, Germany. Photo: Bayer AG. The startups must have initial data proving the effectiveness of their products and should have potential to expand to international markets. Three winning startups will be selected and awarded 700,000 rubles ($10,000) each from Bayer, part of which must be spent on patenting or other forms of protecting their intellectual property. They will also get individual mentor support regarding intellectual property from Bayer experts, and can apply for Skolkovo residency. Once the company becomes a resident Skolkovo startup, it will be eligible to apply for a grant of 5 million rubles ($75,000) from the foundation. The competition jury includes Grigory Ivliev, head of the federal intellectual property body Rospatent – the event’s partner – as well as Elizaveta Rozhdestvenskaya, director general of the Primer Capital venture fund, and several representatives of Bayer, including Jörg Thomaier, chief intellectual property counsel at Bayer Group. “Support for biotech startups from industry is becoming ever more relevant on the innovations market,” said Kirill Kaem, senior vice president for innovations at the Skolkovo Foundation, adding that he was delighted that one of the world’s biggest pharmaceutical companies is showing an interest in young Russian companies. “The key topic of this competition is the potential for intellectual property protection, since a quality patent portfolio and the existence of foreign patents and a sensible IP protection strategy are some of the main criteria for raising investment and commercializing developments,” said Kaem. "We know that today in Russia, young scientists are working on solving extremely important medical and social challenges, and we want to support them, and help these solutions to become commercially successful" - Niels Hessmann, general director of Bayer in Russia. Niels Hessmann, general director of Bayer in Russia and the company’s general representative in Russia and the CIS, said a reliable system for protecting intellectual property rights was the basis for developing innovations in any industry. “In the pharmaceutical business, where investments in developments are some of the highest, it’s of critical importance,” he said. “Bayer doesn’t just work on creating its own molecules, it also facilitates the development of open innovations, helping startups and innovations communities around the world. We know that today in Russia, young scientists are working on solving extremely important medical and social challenges, and we want to support them, and help these solutions to become commercially successful. Within the Patents Power programme, Bayer experts will consult startups on issues relating to patenting innovative developments. We hope that this knowledge, along with grant support, will give an extra boost to the development and roll-out of new Russian products on international markets,” said Hessmann. Rospatent’s Ivliev said he believes that the future lies in crossover areas of knowledge and innovative products that appear at the junctures between traditional natural sciences. “Biotechnology is one of those areas, bringing together biology, medicine, pharmaceutics and chemistry,” he said. “In order for breakthrough products to become available to everyone, for them to be licensed, they have to be securely protected by patents. Cutting-edge ideas must be registered as intellectual property in order to be of benefit to society and to guarantee the inventor and maker commercial success and suitable recompense,” said Ivliev.